One thing fans of horror take for granted is the effects of all those bloody deaths on the survivors. Whether for expediency or indifference, there isn't a lot of mourning going on before the next action piece. 'Chilling Adventures of Sabrina' #4 is different as the titular teenager grapples with the horrific death of a loved one with the pathos and heartbreak you'd only see in real life. It's a remarkable exploration of pain and guilt amid extraordinary circumstances. Sabrina, the teenage witch has historically been about the fun side of witchcraft, with mischievous spells and a talking cat. In four issues, Roberto Aguirre Sacasa and Robert Hack have turned the camp into a bone-chilling satanic thriller. If the drama of everyday teenage life isn't enough, try being a blossoming witch on the cusp of full-fledged witchdom. All you have to do is sacrifice a goat on the altar of the dark lord himself. What could go wrong? We learned everything went wrong leaving someone special to Sabrina dead. The rest of the issue deals with the aftermath. It hits Sabrina hard. She can't eat, she can barely sleep. She's riddled with guilt but bolstered by her Aunts to keep the deception about what happened and trust in the coven to handle the situation. The result is an uneasy and awkward circumstance for Sabrina. Sacasa allows us to experience all the grief and anguish Sabrina is undergoing by staying with her throughout her ordeal and revealing her thoughts as she painfully tries to reconcile her feelings. The issue is a powerful reminder that the loss of someone is very real in this alternate Archie universe. It makes the horror all the more genuine because the consequences are so grave. The work Hack does with such a limited color palette is remarkable. The classic pulp style art, a world inundated in reds, yellows, grays and black, transports the reader to the sixties and to the little town of Greendale. Hack gives 'Sabrina' its signature look that is eerie at times but mostly warm and inviting. It's the perfect way to lull the reader into perceived serenity only to shock you when the time comes. 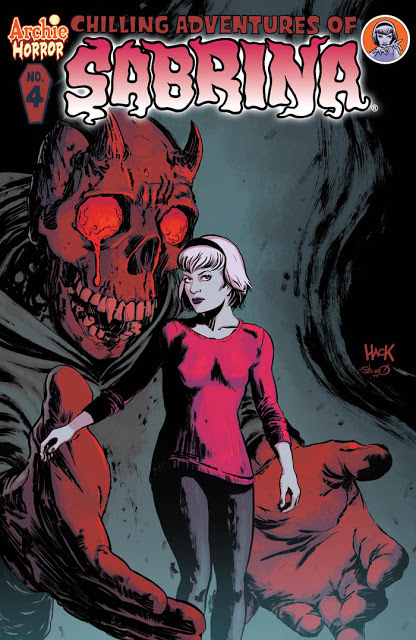 'Chilling Adventures of Sabrina' #4 explores the point of no return for Sabrina with heavy sadness and realistic grief. It sets up the next issue perfectly with a single panel at the end. Yet, it's enough to dread what happens next. 'Sabrina' just keeps getting better and better. Also, look for some familiar guests stars in this issue.